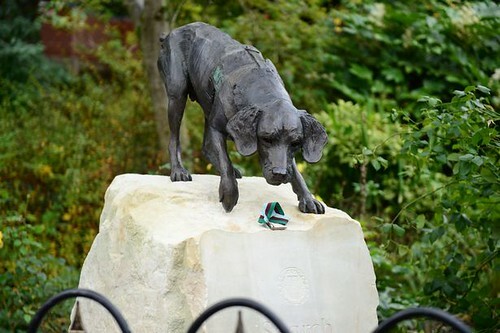 A special sculpture of the dog, who passed away in 2015, was unveiled in Congleton's Community Garden after a fund-raising effort in the town generated £14,912. “We were in a place called Sangin which at the time it was known as 'IED alley' as there were IEDs ( improvised explosive devices) everywhere. 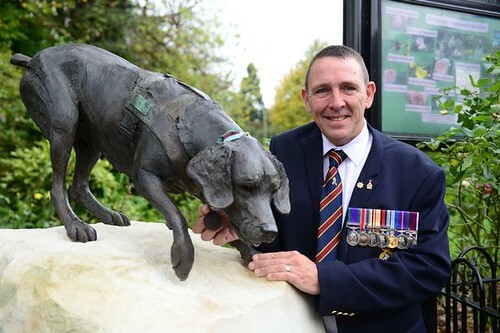 Dave, who wrote a book about his experiences in the war-torn country with his dog, is also pleased families in Congleton can learn about Treo's valiant efforts. “He's immortalised now and it really does look like him. Everyone will be able to look at him now and see that he did that job for his country. Sculptor and portrait artist Amy Goodman had read Dave's book - It's All About Treo: Life and War with the World's Bravest Dog - before she was approached. The talented sculptor who has produced a number of works centred on animals, said: “I’ve always loved animals and to be involved with something so personal has been quite emotional. “I wanted the sculpture to be quite high up so you could see the intensity in his face. I’m really happy with how it looks and it's in a lovely place. The PDSA Dickin Medal was instituted in 1943 in the United Kingdom by Maria Dickin to honour the work of animals in World War II. 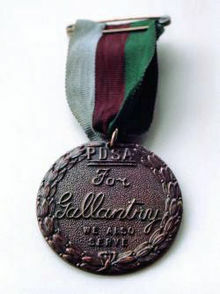 It is a bronze medallion, bearing the words "For Gallantry" and "We Also Serve" within a laurel wreath, carried on a ribbon of striped green, dark brown, and pale blue. It is awarded to animals that have displayed "conspicuous gallantry or devotion to duty while serving or associated with any branch of the Armed Forces or Civil Defence Units". The award is commonly referred to as "the animals' Victoria Cross" (although the Victoria Cross Trust has opposed this association). Maria Dickin was the founder of the People's Dispensary for Sick Animals (PDSA), a British veterinary charity. She established the award for any animal displaying conspicuous gallantry and devotion to duty whilst serving with British Empire armed forces or civil emergency services. The medal was awarded 54 times between 1943 and 1949 – to 32 pigeons, 18 dogs, three horses, and one ship's cat – to acknowledge actions of gallantry or devotion during the Second World War and subsequent conflicts. The awarding of the medal was revived in 2000 to honour Gander, a Newfoundland dog, who saved infantrymen during the Battle of Lye Mun. In early 2002, the medal was given in honour of three dogs for their role responding to the September 11 attacks; it was also awarded to two dogs serving with Commonwealth forces in Bosnia-Herzegovina and Iraq. In December 2007, 12 former recipients buried at the PDSA Animal Cemetery in Ilford, Essex, were afforded full military honours at the conclusion of a National Lottery-aided project to restore the cemetery. The first recipients of the award, in December 1943, were three pigeons, serving with the Royal Air Force, all of whom contributed to the recovery of air crew from ditched aircraft during the Second World War. The most recent animal to be cited for the honour is Reckless, a horse who was injured while serving with the United States Marine Corps in the Korean War. As of April 2016, the Dickin Medal has been awarded 67 times, with Diesel's presentation to take place later in the year.